Main findings	Recovering from the crisis l Following a sudden reversal of capital inflows, liquidity has dried up and an IMF programme was agreed. l The current recession is likely to worsen social conditions. Fiscal commitments allow some additional social spending if poverty increases. l The large share of foreign-currency denominated debt exposed the public sector to currency risks. 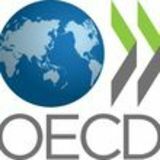 Improving macroeconomic policies and economic governance l VAT exemptions with low social impact undermine revenues. Only 15% of the economically active population pay income taxes. l The independence of the Central Bank has been questioned and this has complicated the fight against inflation. l The Anti-Corruption office has been instrumental in fighting corruption but it lacks functional autonomy. Making growth more inclusive l Rapid ageing jeopardises the long-term sustainability of the pension regime. Generous special regimes for select professions are costly and unfair. l High education spending produces weak results. Teacher training institutions are fragmented and many of them are too small to operate efficiently. l Female employment is low and school drop-out rates are high. l Many workers lack the necessary skills to achieve their earnings potential. l One third of the labour force is informal with no social protection while formal jobs have rigid employment protection legislation. l Sectoral health insurance schemes are fragmented, often too small and face governance challenges. Fostering the integration into the world economy l High trade barriers shield the economy from benefits of international competition. l Greater integration into the global economy will reallocate labour to more productive jobs and sectors. Regulations on product markets and administrative barriers restrict market entry and hamper competition. Strengthening green growth l Greenhouse gas emissions have been declining. Deforestation is on a downward trend. l Agrochemicals use has increased substantially and although the kind of pesticides being used are less hazardous than others, uncertainty about health risks remains. l Air pollution creates significant health damages. Key recommendations Recovering from the crisis l Adhere to fiscal commitments by reducing the fiscal deficit in line with announced targets, prioritising expenditure reductions. l Use the fiscal space granted to raise spending on well-targeted social transfers if social indicators deteriorate. l Develop a domestic-currency denominated sovereign bond market over time. Improving macroeconomic policies and economic governance l B  roaden the VAT base by reducing exemptions and special rates. Lower the basic deduction in personal income taxes. Remove the personal income tax exemption of civil servants in the judiciary branch entirely. l Implement the planned changes to the charter of the Central Bank to strengthen its independence and credibility. Limit the dismissal of its governor to severe misconduct. l Strengthen the operational and financial autonomy of the anti-corruption office and guarantee adequate resources to fulfil its mandate. Making growth more inclusive l Align the conditions of special pension regimes with general pension rules. l Improve spending efficiency in education. Merge smaller teacher training institutions. l Keep expanding early childhood education. l Scale up active labour market policies with a training content. l Extend the unemployment insurance scheme with individual accounts currently used in the construction sector economy-wide while reducing severance costs. l Merge smaller health insurance schemes. Fostering the integration into the world economy l Reduce tariff and non-tariff barriers, starting with capital goods and intermediate inputs. l B  olster adult training programmes and vocational education and training (VET) to ease the transition, with a special focus on women. Reduce domestic regulatory barriers to entrepreneurship and market entry, including at the level of provincial and local governments. Strengthening green growth l Continue developing an automatic early warning system to halt deforestation. Strengthen proper enforcement of the forest law, especially at the provincial level. l U  ndertake an in-depth evaluation of the negative externalities associated with different types of pesticides, their level of application and impact at specific locations and hotspots, with a view to implementing targeted measures to manage pesticide use. Pass legislation at the national level regarding the environmental management of all chemicals. l Implement measures to reduce air pollution, including taxing vehicles according to emissions. The economy is in recession after markets reacted to existing vulnerabilities The economy is in recession. A strategy of reducing the large fiscal deficit only gradually, the reliance on its foreign financing and high interest rates due to tight monetary policy opened up significant vulnerabilities (Figure A). In April 2018, markets reacted with a reversal of capital inflows, exacerbating a slowdown of currency inflows due to a record drought. The current account deficit is expected to decrease and the potential for stronger exports in the future is substantial as the depreciated exchange rate is the most competitive one that Argentina has had in 10 years. Risks are related to the contractionary effects of policies and to external factors. The projected return of market confidence could take longer to materialise if the contractionary effect of macroeconomic policies is stronger or if market volatility remains high. Exposure to external risks is decreasing as the sizeable twin deficits on fiscal and current accounts decline. Upcoming elections in October 2019 imply uncertainty about the continuation of reforms. Source: INDEC, Ministry of the Treasury. Macroeconomic policies responded swiftly to these challenges. While a frontloaded fiscal consolidation and tight monetary policy will lead to a strong contraction of domestic demand in the short term, the adjustment being implemented should eventually pave the way for reduced imbalances. Fiscal and monetary policies are now strongly contractionary The initial strong reliance on tight monetary policy coupled with a gradual fiscal adjustment has given way to strong simultaneous fiscal and monetary contractions. The new fiscal targets aim for a balanced primary result in 2019 and a 1% of GDP primary surplus thereafter. This implies a strong consolidation effort and curtail domestic demand. Its implementation poses political challenges, but not making the adjustment would aggravate risks of a much more prolonged and, ultimately deeper, downturn. 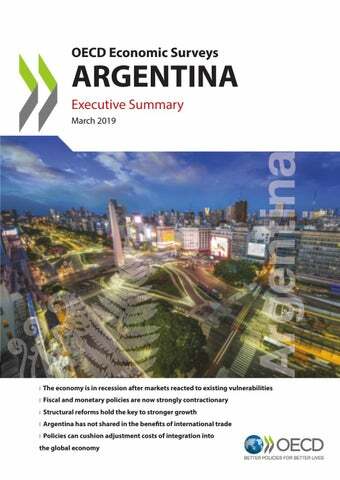 Indeed, adhering to the fiscal targets will be seen by markets as a litmus test for the Argentinian authoritiesâ&#x20AC;&#x2122; willingness to resolve the serious macroeconomic imbalances facing the country. Bringing down high inflation has proven very challenging (Figure B). Recognising weak transmission of monetary policy, the Central Bank abandoned inflation targeting and has committed to keeping the monetary base constant in nominal terms until July 2019. A new framework for currency interventions allows the exchange rate to float freely within a moving corridor, while allowing limited interventions if the exchange rate leaves the corridor. Structural reforms hold the key to stronger growth Since 2015, the current administration has made considerable efforts to create conditions for sustainable and inclusive growth. Recent reforms include a tax reform, changes in the fiscal relations between the provinces and the central government, a new competition law, improvements in the sustainability of the pension system, new legal frameworks for capital markets and for public-private partnerships, the creation of an independent fiscal council and a commitment to bolster the independence of the Central Bank. But much more remains to be done. Many policies are in place to protect the poor and most vulnerable groups Around 27% of Argentinians live in poverty and 5% in extreme poverty, half the level after the last major crisis in the early 2000s. Figure C. Poverty has been on a declining trend This declining trend continued during 2016 and 2017, until the recession raised poverty again during 2018 (Figure C). Social policy will remain important to achieve more inclusive growth and cushion the current recession. Fiscal targets have been defined in a way to allow some limited space to expand well-targeted benefits, which should be used to protect low-income households from the burden of the recession. Source: Tomarolli, L. (2018), Series Comparables de Indigencia y Pobreza, CEDLAS, UNLP, INDEC as of 2016-II. Argentina has not shared in the benefits of international trade Argentina is significantly less integrated into the world economy than other emerging market economies The main reason for this are high tariffs and nontariff trade barriers. Reducing trade barriers would raise consumer purchasing power, especially for lowincome households, and would reduce the cost of firmsâ&#x20AC;&#x2122; inputs. Trading little, Argentina has also remained on the side lines of global value chains, all of which represents significant lost opportunities for growth and well-being. Stronger integration into the world economy would also raise competition and lead companies in shielded sectors to become more productive. Currently, many jobs are trapped in activities with limited potential for productivity and wage growth. Priority should be given to reducing tariff barriers in capital and intermediate goods, to support competitiveness and job creation. Policies can cushion adjustment costs of integration into the global economy As jobs move across firms and industries, new opportunities arise. Exporting firms are more likely to be formal and pay 30% higher wages. But job reallocation can also require re-training and result in temporary income losses. Policies that could ease the transition include enhancing training and social protection, improving the functioning of product markets and strengthening innovation. High severance payments are currently the principal insurance mechanisms against dismissal-related income losses, but only for workers in the formal sector. Their high and uncertain costs for employers reduce incentives for creating formal jobs, which could delay job creation during the recovery. For new jobs, extending the current unemployment insurance scheme used in the construction sector, which is based on individual accounts, economy-wide while reducing severance costs would make formal hiring less costly and protect individuals rather than specific jobs. Education and health policies are crucial for ensuring inclusive growth Improvements in the quality of education have high pay-offs. They prepare future generations for new opportunities, address skill shortages and can help raise low female labour participation (Figure E). 40% of secondary students leave school without a degree, often owing to a failure to acquire essential skills during early childhood. This could be addressed by further expanding early childhood education, which would also allow more women to seek remunerated employment in the workforce, increasing their incomes and life-options.